Or at least that’s the title of this article at that wretched hive of misinformation, the Huffington Post. I’ve written before about Huffpo HuffPoo and More HuffPo HuffPoo: The Annual Flip-Flop Warning. But this time they’ve outdone themselves. What they’ve done is show themselves to be totally incapable of reading a (fairly simple) scientific paper. But to be fair (kind of), they obviously didn’t read the scientific paper. All they did was look at somebody else’s article—somebody else who also didn’t read the scientific paper. Scientists have produced study after study proving what women already know: Heels hurt your feet. A lot. Specifically, shoes with heels strain your calf muscles, permanently shorten your tendons, damage your posture and twist your ankles. But we’ve got some consolation for all your heel devotees: High heels do NOT give you bunions! That’s not what the study shows at all. What the study (maybe) shows is that there is some genetic component to bunions, that is, hallux valgus. The article they link to is this one: Bunions — family not footwear to blame, which comes with this cringe-inducing photograph. This is what we tell our patients — as opposed to the myth that shoes cause bunions. No, that’s not what the study showed at all. And it is no myth that shoes cause bunions. No they didn’t. The title of the scientific article is Hallux Valgus and Lesser Toe Deformities are Highly Heritable in Adult Men and Women: the Framingham Foot Study. So where did “Blame Your Parents for Bunion Woes” come from? That’s the title of the press release put out by the publisher, and was almost assuredly written by some clueless editor. Anyways, let’s take a look at the study itself. First, Framingham, MA, is rather famous for where the Framingham Heart Study is going on. That is a long-term heart study that has followed, with extensive surveys and records, three generations of the people of that town. It turns out that there is also a Framingham Foot Study. So what the scientists were able to do was also look at the incidence of hallux valgus. They looked for a family history of bunions (and some other foot disorders). Here’s how it works: you share about 50% of your genes with each parent, and about 50% of your genes with each of your siblings. The researchers put together a bunch of such pairings in 429 families (1,370 total participants) and looked at the correlations between bunions of the pairings. Now, if a predilection towards bunions is hereditary, then people within the same family will be more likely to have the same bunion-status (either yes or no) than people randomly chosen not to be in the same family. And that is what they found. That is all they found: bunions tend to run in families. But what, you say, about nature versus nurture? It’s never actually stated in the study, but it is assumed that all the participants live in a similar environment and that all the variation they are seeing comes from genetics, not from a difference in environment. Suri Cruise, I suspect, is an excellent example of how bunions could be passed down through one’s environment. Hallux valgus is one of the most common foot disorders, affecting approximately 23% of people aged 18 to 65 years and 36% of those aged over 65 years. Hallux valgus is one of the most common foot disorders, affecting approximately 23% of shod people aged 18 to 65 years and 36% of the shod aged over 65 years. 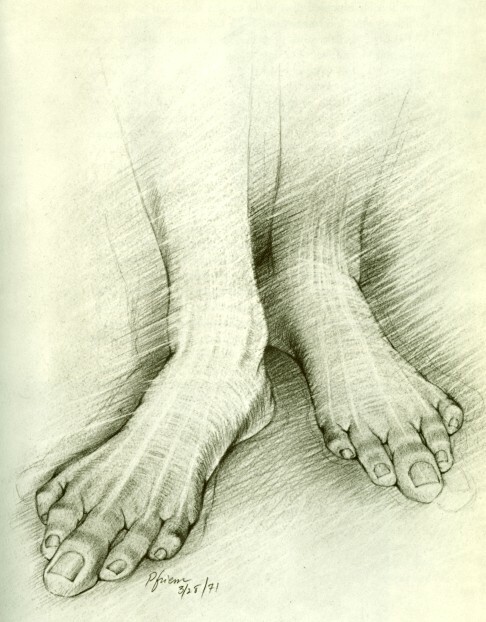 No instances among the barefoot feet were found of: Onychocryptosis, Hyperidrosis, Bromidrosis, Hallux Valgus, Hallux Varus, Bursitis at the first or fifth metatarso phalangeal articulations. Similarly, a study by Lam Sim-fook, A Comparison of Foot Forms Among the Non-Shoe and Shoe-Wearing Chinese Population, found that 33% of their subjects who wore shoes had hallux valgus while only 2% of the unshod had it. In the Framingham study, it was stressed that the study subjects were exclusively Caucasian (Framingham is pretty white: only 6% black, for instance), so it is possible that European Caucasians have some sort of special susceptibility to hallux valgus (I say “European” since Indians, as in the Shulman study, are also generally Caucasian). But I doubt it. So, what do I think the study has shown (even assuming that there are no environmental factors)? That when you cram a foot into a shoe, there is some sort of genetic predisposition for that to lead to bunions. Some feet are genetically able to better resist the abuse. You don’t get hallux valgus with those feet, do you? Bunions — family not footwear to blame. Sunburn — family not the sun to blame. Sure, there’s a genetic component to getting sunburned; but that doesn’t mean the sun is blameless. And yes, there may be a genetic component to bunions, but it is abundantly clear that shoes are needed to really bring them to the fore. I feel like high heels and restrictive/supportive shoes in general should be considered risk factors for health insurance. If your parents feet were not genetically suited for wearing shoes, then there’s a good chance your feet are not genetically suited for wearing shoes. I do think that maybe this entry is a little angry sounding. That’s perfectly justifiable given the subject, but it is going to enable people to push it off as just a rant. Having said that, everything you say is, as far as I am aware, perfectly correct. It is simply amazing and staggering that people can even suggest bunnions are caused by pure genetics. Not a rant, a fisking. Shoes are obviously the cause of bunions. This was clearly shown by the increase in Hallux Valgus procedures in Jonan Hospital, Tokyo Japan. As the Japanese abandoned their traditional sandal-type footwear for fashionable Western shoes, the number of bunion surgeries increased more than100 fold over the period of 1985 to 1990.